Hello hello hello! How are you today lady? In the thick of the holidays? But I know You got it – all the women I work with are pretty on top of their game so if you are listening I’m assuming you are too. Today I want to discuss the idea of pleasure. More specifically I want to discuss the idea of well-being pleaser and false pleasure. I want to talk about feeling good – but it might not be in the way you think. I think especially this time of year it is important to consider what each means because becoming aware of the differences really allows you to be more mindful in how you go about finding your pleasure. See – I think as a society we programmed to look for those things that make us feel good. It’s funny -I recently overheard someone say its chocolate – chocolate makes everything better..lol.. Ok, ok – so maybe I’ve even said that once or twice but as I do this work I am learning at a deeper level this idea of true, well-being pleasure. So often we look to external things to give us pleasure. Overeating – especially highly concentrated sugar and flour, over drinking, over spending, other people’s approval. All of these are things that we think feel good. But the problem is – then we become dependent on these things in order to feel good. Now, I’m not saying chocolate and wine are bad things. I’m just suggesting we start looking at where we have our own, true self well-being vs where we are looking for it from external sources. Because here’s the thing – the external sources will eventually go away. And then it’s almost like a roller coaster – we seek the pleasure, we get it temporarily, and we go back to seek again. Vs. knowing and finding pleasure within yourself. So things like accomplishment, knowing you are enough but still wanting to take yourself to the next level, not wanting to acquire more, but to do more with this amazing life you have been given, are in line with well-being. Believing in yourself is another big one. Knowing you can do hard things and you always have your own back. Really taking your life to your full potential – that is what well-being pleasure is about. Because you know what happens – when you start working on those areas, you don’t need to keep reaching for the extra glass of wine in order to feel better. See, if you are doing this work you want to evolve, to become your next best self. 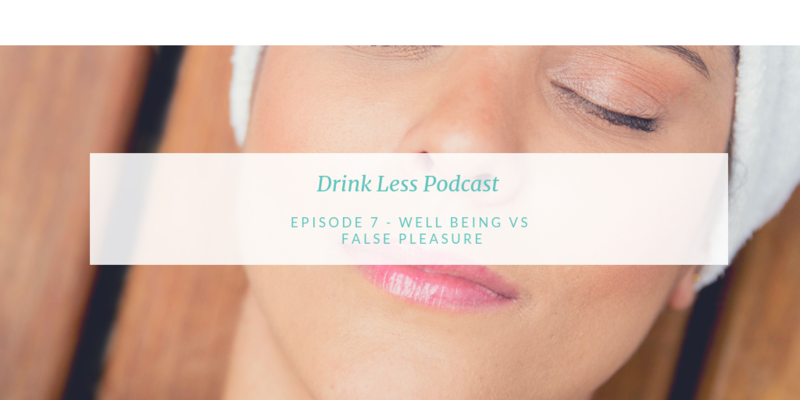 Knowing how to feel better by lessening or eliminating some of your false pleasures and increasing your well-being is what helps you get there. You learn to feel better when you are doing amazing things in your life. I also think for a lot of us we sometimes have reached to the alcohol – or even extra food – because we are bored. We like to feel accomplished, but sometimes we don’t know what we want to do next so it’s just easy to grab the glass of wine, or cookie, sit down, and chill. But that doesn’t bring about the growth we so desire to achieve. And that’s a disconnect that we struggle with. Well-being pleasure extends beyond the traditional definition of health. It includes choices aimed at achieving physical and mental vitality, social satisfaction, a sense of accomplishment and personal fulfillment. Like what makes you happy along these lines? What is it you want to do with your life? That’s the work that I want to help teach you here. The thing is – in order to achieve that level of well-being you also need to learn to be ok with being uncomfortable at times. My coach likes to say discomfort is the currency we pay to get to the next level. It’s just like they say – if anything was easy in life more of us would be doing it. The key is – being ok with being uncomfortable. The discomfort is only because your brain doesn’t like to change. It likes easy and efficient, so it will always go to the wine or cookies or Netflix. Your work is to manage that mind. Because what I found with myself and many clients is that what brings us to this work is the discomfort we feel because we want to have some sort of transformation. We want to take our life to the next level, and being stagnant causes discomfort. So the question becomes – do you want to continue in the discomfort of your life remaining the same, or do you want to feel the discomfort of being bored or anxious. Because bored and anxious are simply feelings. When you can sit in that discomfort, show yourself you can survive – that my friend, is the currency you pay to make it to the next best version of yourself. This week I encourage you to become more mindful in asking yourself this – what is it you want in the moment, vs what you want for your future goals to reach your true potential. Some of my clients like to even write themselves a little note in their phone – or anywhere you can quickly glance at it. The idea is the note is a little message from your future self, reminding you why you are doing what you are doing today. So let’s say you planned to have one glass of wine. After the glass your brain is like – oh, well that was lovely – we should have another. FALSE pleasure alert! Take a look at your phone – take a look at the message thanking you for sticking to your plan, thanking you for sitting with a little restlessness today, because your future self knows how good it can be. OK – that’s it for today! Let’s circle back next week – but for now – make it a great day – take care!